Based on reviews from 419,453 users. Learn how our rankings work or see our guide to Vans skate sneakers. Updated Apr 2019. People nowadays have different and several options when it comes to looking for footwear that delivers a stylish silhouette without compromising comfort. Vans skate sneakers are worthy to consider as part of one’s arsenal. Vans offers sneakers that are available in a variety of silhouettes such as Old Skool, Era, Atwood, SK8-Hi, Half Cab and Authentic for men and women. These Vans unisex skate sneakers are also available in a myriad of colors like black, white, brown, grey, pink, red and blue, among others. Most often than not, Vans skate shoes are available in men’s sizing. However, Vans sneakers are known to have a unisex style so ladies can just simply pick 1.5 sizes down than their usual foot measurement from the men’s sizing to get their exact fit. Like most of the Vans skate sneakers, it has a canvas upper with double stitching. It has a cotton drill lining. It has a cushioned tongue and collar for added comfort. It utilizes a vulcanized rubber outsole with the waffle tread that delivers precise board feels and superior grip. Like most of the Vans skate sneakers, the Vans Era 59 is available in a myriad of colorways like white, grey, red, brown and black. It has a sturdy canvas upper with metal eyelets. It has leather heel accents. It has a padded ankle collar for flexibility and support. The rubber outsole has the waffle tread pattern for reliable traction. It is among the men’s Vans skate shoes that are available in sizes from 3.5 to 13 US. The Pro skaters version of the Era has a sturdy upper with a combination of suede and canvas materials. It is among the Vans skate shoes with UltraCush HD sockliners that provide excellent board feels and amazing impact cushioning. It utilized Pro Vulc Lite construction for reliable traction and flexibility. For unrivaled durability, the Duracap reinforcement rubber overlays are installed. It is available in sizes from 6.5 to 13 US, in medium width. Some of the available colorways are Black Amazon, Rose Taupe, Blackout, and Black/White/Gum. It is among the Vans skate shoes that feature a straightforward and lace-up profile with a sturdy canvas upper. Some of the available colorways are Winter Moss/True White, Birch/True White, Sea Fog/True White, Ochre/True White, Desert Sage/True White, Hot Sauce/True White and Dry Rose/True White. It has a rubber outsole with the signature waffle tread pattern for superior grip. This iteration is among the Vans unisex skate sneakers that are available in sizes from 3.5 to 10 US and 5 to 11.5 US for men and women respectively. The sturdy upper is made of suede or canvas material. It has a lace-up closure system with metal eyelets for a flexible fit. The Authentic Platform 2.0 from Vans has a platform rubber outsole with a waffle tread for reliable grip. The Authentic Surf is among the Vans skate shoes that feature the nubuck leather upper with graphic line details. It has molded UltraCush sockliners built with upgraded cushioning. It has an outsole with the waffle tread pattern for a sure-footed grip. It has a midsole with single-wrapped foxing tape that provides lightweight comfort. Like other Vans skate shoes, it is available in sizes from 3.5 to 13 US and 5 to 14.5 US for men and women respectively. Like most of the iconic Vans skate shoes, this iteration is available in numerous colorways like Madder Brown/True White, Black/White, Deep Grass Green/True White, Falcon/True White, Baby Blue/True White, Sea Fog/True White, Hot Sauce/True White and Navy/White. It features a sturdy upper made of canvas and suede materials. It has padded lining and tongue for added comfort. Same with other Vans skate sneakers, it utilizes the waffle tread pattern on the outsole for reliable grip. Among the Vans skate shoes, this version features a supple and lightweight textile upper that provides relatively breathable and comfortable experience. It is among the Vans unisex skate sneakers that are available in sizes from 5 to 14.5 US and 3.5 to 13 US for women and men respectively. It has re-enforced toecaps to weather the repeated wear. The outsole has the waffle tread pattern for reliable grip. With the classic and timeless aesthetic of the original Vans skate sneakers, the lighter model of the Old Skool offers a relatively lightweight feel and fit because of the innovative construction method. It is among the classic Vans skate shoes that deliver increased flexibility and improved comfort because of the UltraCush Lite sockliners. With a sturdy canvas upper, it has added heel cushioning. Like other Vans unisex skate sneakers, it is available in sizes from 5 to 14.5 US and 3.5 to 13 US for women, and the boys and men respectively. This shoe is available in colorways including Black/White, Navy/White, Port Royale/True White, and Black/Black. It is also available in Checkerboard Old Skool Lite iteration. The Classic Slip-on is available in sizes 5 to 17.5 US and 3.5 to 16 US for ladies and men respectively. It has cushioned footbed and collar for added comfort. It has a canvas upper with elastic goring accents that sits atop of a vulcanized waffle outsole. Like other Vans unisex skate sneakers, it is available in different colorways like Charcoal, Ballerina/True White, Black/Black, Black/True White, Sea Fog/True White, Birch/True White, and True White. This kick has a sturdy canvas upper with juxtaposing large and small black and white checkerboard print allover. It is accented with elastic side goring for a secured fit. It has a cushioned ankle collar. Like other Vans skate shoes, it has the durable rubber waffle outsole for reliable grip. This iteration of men’s Vans skate sneakers is available in sizes from 3.5 to 13 US. Same with other Vans skate shoes, it has a cotton lining. It is among the Vans unisex skate sneakers that can be grabbed in sizes from 6.5 to 13 US for men while 8 to 14.5 US for women. It has a durable canvas upper with the flame graphic. The iconic flame is bright in this Slip-On version. Launched in 1988, the Half Cab was released as the first signature shoe of Steve Caballero. It is among the iconic and culturally significant Vans Skate sneakers in the skateboarding history. The Half Cab is available in sizes from 8 to 14.5 US for men and 6.5 to 13 US for women. Like other Vans skate sneakers, it has cushioned footbed as well as padded tongue and collar for comfort. It is available in colorways including Black, Black/White, and Navy. Released in 2007, the made for pro skaters Half Cab utilizes UltraCush sockliners for enhanced performance by providing excellent board feels as well as impact cushioning. It features a durable canvas upper with single-wrapped foxing tape. The high wear areas have Duracap reinforcement rubber overlays for increased durability. Like other men’s Vans skate shoes, it is available in sizes from 6.5 to 13 US. The Vans SK8-Hi, also known as the Style 38, debuted in 1978. With a high-top profile, this shoe is among the women’s and men’s Vans skate sneakers that offer ankle protection and support. It focuses on delivering performance that a user may seek. The Lite version of the SK8-Hi features a combination of cow suede and canvas uppers. It utilizes UltraCush sockliners for comfort and increased flexibility. It is among the Vans skate shoes that use Duracap toe bumper for superior durability and support. It utilizes Actionfit technology for an increased heel height and to deliver a relatively balanced feel in every step. It has vulcanized lug outsole that delivers maximum traction. It is among the Vans skate shoes with a premium and water-resistant leather upper that are built with MTE 360. Depending on the design, it has the textile, flannel or fleece lining. It is made with re-enforced toe caps to battle repeated wear. It has cushioned collar for flexibility and support. What are some of the technologies in Vans skate sneakers? MTE 360™ - It enhances heat retention around the foot. It also improves the shoe’s moisture management. Ultracush HD Sockliners – A resistant, flexible and lightweight insole that gives the balance between board feel and damping, ensuring excellent cushioning. Duracap – It fortifies and protects all the shoe’s high wear areas. It has durable rubber layers that offer reinforcements to withstand the toughest demands. Luxliner – Located underneath in the front area of the upper, it is a breathable liner that provides foot ventilation and comfort. It also stabilizes the foot inside as the liner moves independently. It delivers responsive board feels as well as snug fit. What are some of the notable collaborations for Vans shoes? Where can I buy cheap Vans skate sneakers? What are the DON'Ts in cleaning Vans sneakers? Don’t machine-dry and -wash the sneakers for it will break down, resulting in greater damage. Don’t use harmful detergent and soap. What do Vans sneakers are usually made of? Generally, Vans skate sneakers utilize canvas, leather, synthetic, twill, mesh, wool, corduroy, rubber, suede and textile materials. What are the usual designs of Vans skate shoes? Vans skate shoes are available in a low-, mid- and high-top silhouettes that can have plain or colorful designs. Some of the patterns that may be seen on the shoe are checkerboard, checker flame, cherry flame, mix checker, flame and Vans’ screenprint. Other iterations that are utilized on collaborative works bear patterns and designs that pay homage to the artists like the Vans ATCQ collection and Vans x Marvel collection. How to style the Vans sneakers? There are so many ways how to style the Vans unisex skate sneakers. Vans shoes possess a versatile silhouette that looks great with a variety of casual and smart casual outfits. Below are some of the suggested ways of wearing the Vans kicks. For a combination of casual and smart look, men can wear a pair of Vans Old Skool or Authentic sneakers and match it with black shorts and a white shirt and grey blazer. Boys can also pair their vans black skate shoes with skinny jeans and white shirt with a charcoal tucker jacket for weekend activities. Men can wear Vans skate shoes with a black cardigan to show off a smart look. Men can match their black Vans skate shoes with white chino pants and a black leather jacket. Ladies can wear a black pair of Vans Sk8-hi sneakers and match it with liquid leggings and menswear coat for a sophisticated look. Women can also wear a pair of high-top Vans skate shoes and match it with denim fitted jeans and cool leather jacket. Like Kaia Gerber, ladies can match a pair of white high-top Vans skate sneakers with a mini-dress for a sporty look. For an upgraded casual ensemble, ladies can wear a pair of black Vans Authentic Platform and match with fitted jeans and a turtleneck shirt. 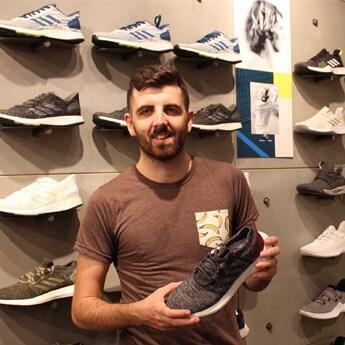 Where are Vans sneakers made? Some of the Vans’ factories are located in China and Vietnam. What are the price ranges of Van skate shoes? How do Vans shoes fit? 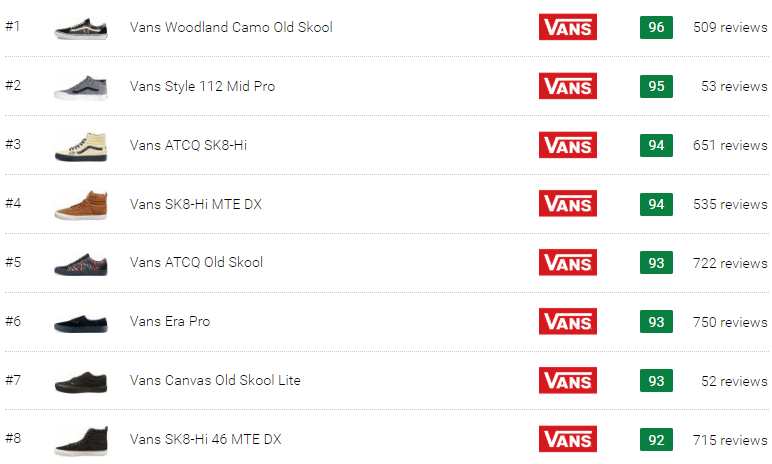 Generally, Vans unisex skate sneakers are available from 5 to 17.5 US for women and 3.5 to 16 for men.